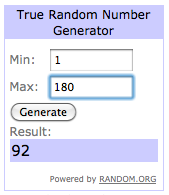 Well, the giveaway is closed, and a winner has been selected using Random.org. Congratulations! I've sent her an email, and she'll have until February 2nd at 5:00 PM (MST) to reply. If she does not, I'll go ahead and pick another winner. You guys all rock for entering, spreading the word, and bumping up my blog's follower count to over 300! 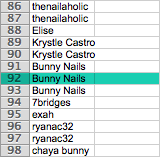 CONGRATS Bunny Nails!!! You deserve it!!! Yay! Congrats to Bunny Nails! Thank you for the giveaway and congrats to Bunny Nails. Yay! !